Hotel Dieu Shaver strives to provide a delivery system worthy of our patients' and families' trust. At Hotel Dieu Shaver, our person-centred care approach means clients are viewed holistically and compassionately. Person-centred care involves respecting human dignity through patient advocacy and empowerment, and respecting the patients’ autonomy, voice, self-determination, and participation in decision-making. Hotel Dieu Hospital began in 1944 when Senator J. Joseph Bench, a prominent St. Catharines Lawyer, Dean Michael Cullinane, pastor of St. Catherine of Alexandria Church, and Toronto's Archbishop James Cardinal McGuigan pursued the opportunity to establish a Catholic acute care hospital in St. Catharines in an effort to provide adequate health care along with the already existing St. Catharines General Hospital. Due to its good reputation and excellent credentials, the Kingston based Religious Hospitallers of St. Joseph (RHSJ) were invited to help plan and build the new hospital. Mother Mary Immaculate, Sisters St. Catherine Brennan and Veronica Callahan from RHSJ arrived in 1945. Soon after, the RHSJ along with a group of dedicated citizens began to raise money for this exciting new project. While the hospital was being established, the sisters purchased a large home and began a 28 bed maternity hospital which would close once the acute care hospital opened. On May 18, 1953, the cornerstone was laid and the hospital was dedicated as Hotel Dieu or translated as 'Hostel of God'. Throughout the years, the hospital expanded to provide necessary healthcare programs such as kidney dialysis centre, an eye clinic in 1974 and oncology clinic in 1985. Our operating name changed in 2005 when Hotel Dieu Hospital took over the governance and management of the Shaver Hospital as a result of new directions for health care restructuring by the Ministry of Health and Long Term Care. The St. Catharines Consumptive Sanatorium was established in 1909 and subsequently as the Niagara Peninsula Sanatorium for tuberculosis and chest diseases. In 1972, the name changed to Shaver Hospital for Chest Diseases in honour of the dedicated physician Dr. Cecil Shaver and finally in 1984 The Shaver Hospital. In our new role of Rehabilitation, Complex Care and Geriatric Services, we are proud to continue the tradition of our founding sisters to provide compassionate care and to meet the unmet needs in our community which we are pleased to serve. Download the full account of Our Legacy. 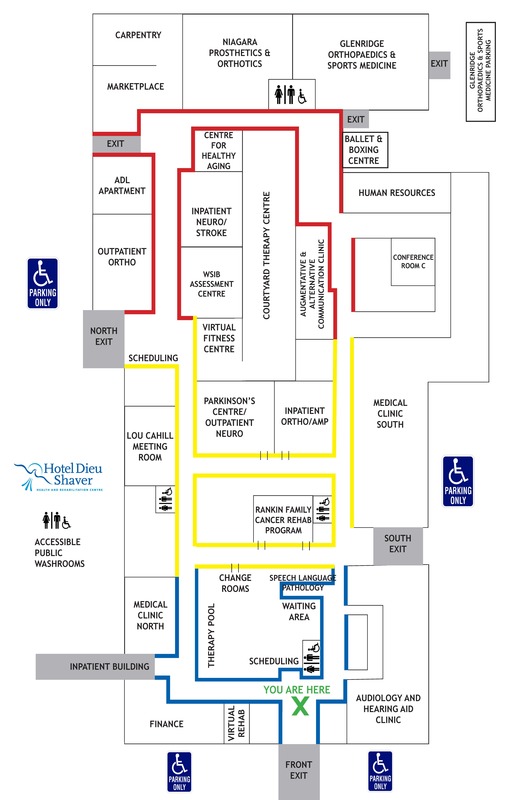 At Hotel Dieu Shaver Health and Rehabilitation Centre, we work closely with our healthcare and community partners to ensure high quality, timely access to care, and to make systematic improvements that will benefit those in need of care. Click here to view more information on Professional Resources. Multilingual Services provided on request.